DARE graduation has been rescheduled for 4/26 @ 1:00. KMS softball games have been canceled for tonight. The KMS vs. Corinth baseball game has been postponed due to rain and field conditions. We hope to reschedule the game for a later date. The 7th and 8th grade KMS baseball game scheduled for tonight has been postponed due to rain. We will post the makeup date at a later time. TCPS has canceled the KMS baseball game. We will play one intrasquad game starting at 5. Congrats to the KHS Lady Aggies!! 3A state champs!!! Good evening, this is a message from Kossuth Track team. The KHS Track team Super Hero 5 K has been moved from Saturday, to Sunday at 2pm due to the Kossuth Girls playing in the basketball state championship. The 7th and 8th baseball games against TCPS have been cancelled. We hope to reschedule them for a later date. Good afternoon parents. This message is to inform you that the fifth and sixth grade basketball games scheduled for tomorrow night have been rescheduled to Tuesday, February twenty sixth. Thank you and have a great afternoon. KMS and Alcorn School District will be closed on 2/22/19. Good evening parents. This message is to let you know that tonight’s fifth and sixth grade basketball games have been cancelled. We will let you know a make up date as soon as possible. Thank you and have a great evening. Students will be out of school on 2/18 for President’s Day. Students will return 2/19. Student progress reports go home today. 8th grade boys are back in action tomorrow night at 6:30 in the 5 county tournament at NEMCC. Go Aggies!! Congrats to both the 8th grade teams on their wins in the first round of the 5 county tournament! Games tomorrow at 5:30 and 6:30. Go Aggies!! KMS and ASD will follow a regular schedule today. 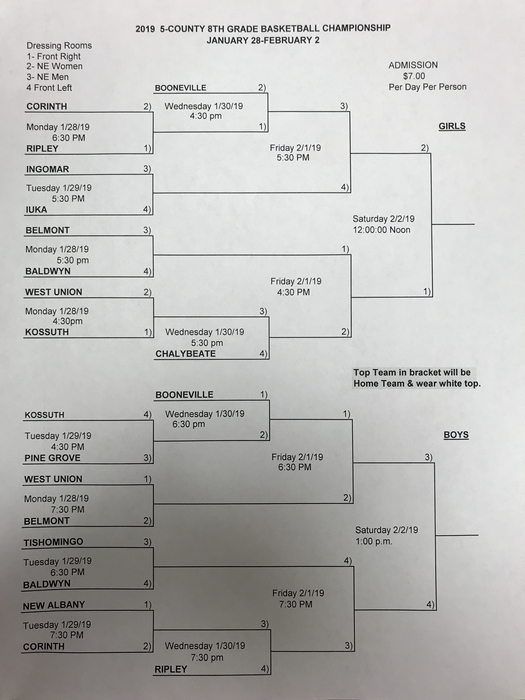 The 5 county basketball tournament begins today. Go Aggies!! 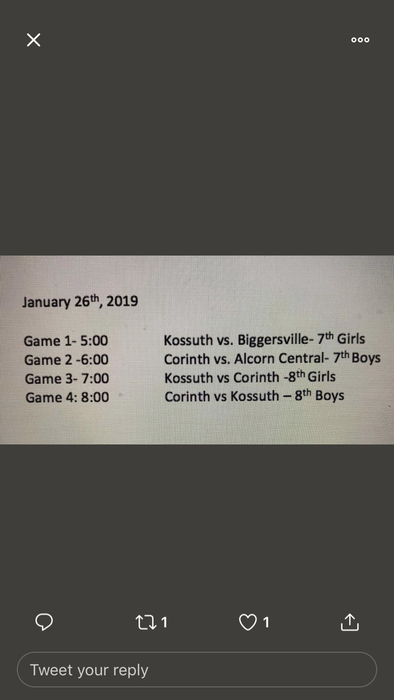 KMS Aggies playing in the Alcorn County Tournament championships tonight! Go Aggies!! KMS will be closed on 1/21 for the Martin Luther King holiday. KMS vs ACMS basketball games will start @ 5 in the ACHS gym. Student report cards go home today. 12/19 will be the final day for students, before Christamas break. Students will dismiss at 1:30. Classes will resume as normal on 11/26. Kossuth Middle School will be closed 11/19-11/23 for the Thanksgiving holiday. Students will return to school as normal on 11/26. Happy Thanksgiving!! Congrats to the KHS boys and girls cross country teams!! Both are class 3-A state champions!!! !